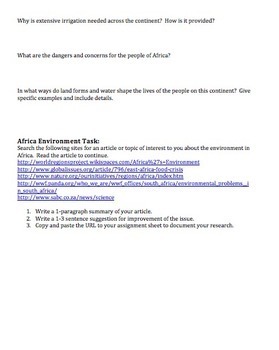 Looking for an easy way to introduce the key content on the Geography of Africa? 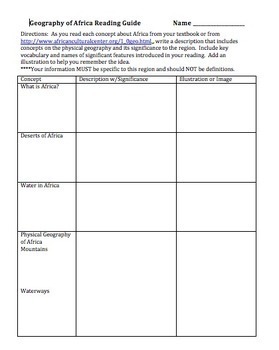 Want a complete lesson with great organization of key content on the Geography of Africa? This is a bundle with 2 reading guides to use when introducing your students to African Geography. Choose one or the other, depending on your text or your student ability level. Online reading sources are also provided to replace a textbook in this activity. Activity includes an Environmental Research & Writing Activity for added emphasis on current issues in the region. 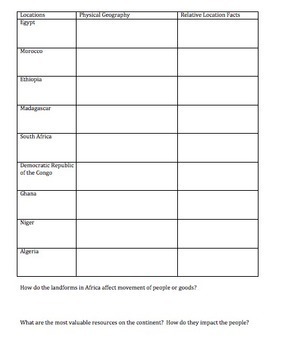 Assign as individual reading or allow students to work in pairs or small groups to gather the information they need to overview the Africa in your Cultural Studies or Geography course. 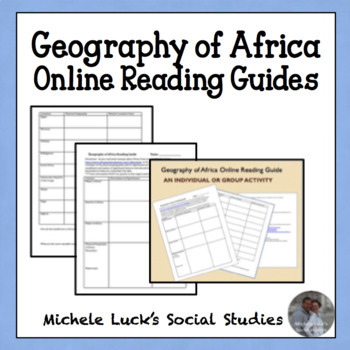 These reading guides are also available in my store in a Geography of Africa Complete Unit. See my Store for other great Social Studies lessons, activities, and more!